Chinese Making A Power Play In Nicaragua With New Canal? - Page 2 - Politics, News, and Hypocrisy - Chickensomething What Are You Afraid Of? Chinese Making A Power Play In Nicaragua With New Canal? I'm sure he's aware of it as it's big money at work. Even he couldn't afford it! He mentioned how the Chinese and the Japanese are getting the best out of every deal. That Americans were getting screwed sideways and from above. Should the U.S. Worry About China’s Canal in Nicaragua? Following an agreement between the Nicaraguan government and shadowy Chinese billionaire Wang Jing, there may be a new canal in the Western Hemisphere. 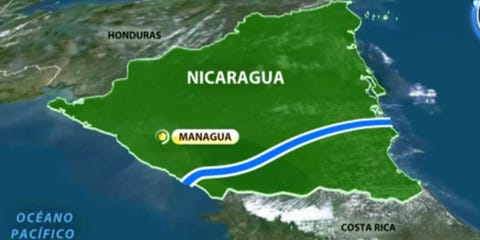 The possibility of a transoceanic canal through Nicaragua has been discussed for almost 400 years. Nicaragua was almost the place for the U.S.-built canal until, for a number of reasons, Panama became more attractive. Wang Jing and Nicaraguan officials envision a competitor to the Panama Canal built for supertankers and cargo ships too large to pass through Panama, and insist that the megaproject would spur economic development by transforming Nicaragua into a global trade hub. Work on the project is already underway. Still, some serious questions remain unanswered. Plans for a Nicaraguan canal have been drawn up and scratched many times, but this latest attempt likely has the political and financial backing necessary to make it through to completion. President Daniel Ortega has made the canal a centerpiece of his legacy. Ortega, who recently made changes to Nicaragua’s constitution that will allow him to hold office for life, has the parliament in lockstep behind him. In a 2013 vote the parliament agreed to offer Wang Jing a 100-year concession to build and operate the canal. The vote went through without debate, public consultation, or feasibility/environmental impact studies. There is virtually zero chance of Daniel Ortega leaving office prior to the end of the project’s projected 5-year completion timeline. Yep, this is a big story. All kinds of side deals going on. why don't they say these things in the news? i thought we were supposed to be doing it. i thought when noriega was screwing up america was going to build more. Police in Nicaragua have denied claims that at least two people were killed during violent protests that followed Monday’s inauguration of work on a proposed 173-mile canal to connect the Atlantic to the Pacific. The government of President Daniel Ortega staged Monday’s groundbreaking event as it was besieged by questions about the $50bn (£32bn) project’s feasibility and desirability. At least 21 people were hurt and 33 arrested when hundreds of farmers protested, saying the project would force them from their land. Yes, I realize these are older stories. But, it does look like this new canal may get built. How does this affect the United States? Especially, if it became a political item to be reckoned with. Shouldn't we be looking at these questions and more now? Dig deep enough one begins to see the 'Art of the Deal' in play! we could overthrow nicaruaga government and take over the canal. remove china from the picture. the chinese government makes billionares. if they dont want a private billionaire they just put him in jail and take everything and give it to somebody else to control. i wonder what Trump would say about this? The same guy, same company! Why isn't someone putting a camera in Trumps face and asking questions about the business deals going on down there in Central America? Those are good points. Seems like Chinese Billionaires want to build great projects and American ones want to put on shows of Will Rogers Follies. Maple syrup for every household.